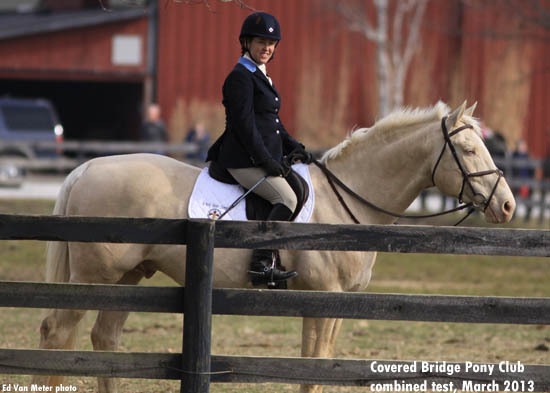 About Moserwood Farms, professional care, training and instruction for all sport horses. 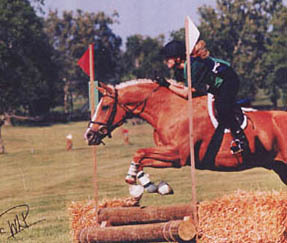 We offer a first class sport horse boarding facility with options to suit almost anyone. 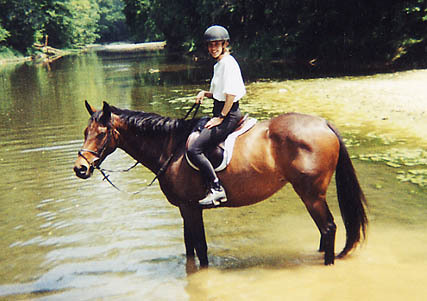 Our clients can take advantage of professional instruction and training for all levels of riders and horses. We are active in our local riding community and support our riders at all levels who want to go to clinics, shows and trail rides. We also offer organized rides and clinics at our own farm and encourage everybody to socialize and get to know each other. 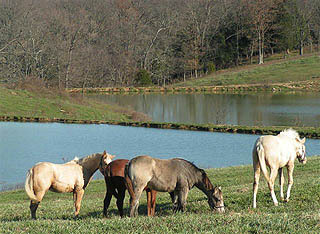 Even non-riding family members can enjoy the peace, tranquility and friendliness of this special place. 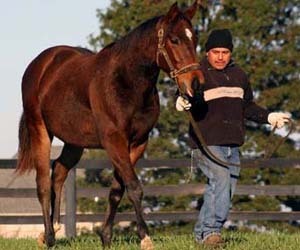 We also offer services to support our clients who are involved in thoroughbred racing: from breeding, foaling and breaking, to retraining thoroughbreds for other sports after retirement from racing. For those who would like to purchase or sell horses privately or at auction, we offer sales agent services and auction representation. We provide the best possible care for your horses, plus management options to fit your budget and help you reach your goals. Our location is superb, our staff first rate and highly sought after, and we maintain a small operation that allows you first hand information on how your horse is doing. 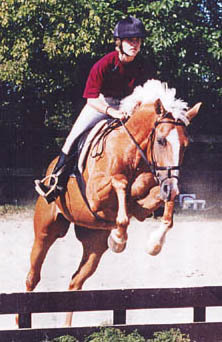 Owners are directly involved with decisions on care and training of their horses. We value our reputation and treat our customers as we would want to be treated, and their horses as if they were our own. We have an open door policy and invite visitors. If you would like to visit either of our locations (Prospect and Moserwood II in Henry County), please email Kim at moserwoodfarm@gmail.com for driving directions. One of our priorities is the placement of thoroughbred horses in a timely and well managed fashion as they come off the track from racing into retirement, with a plan for the new owner to continue their training and transition into a new life. 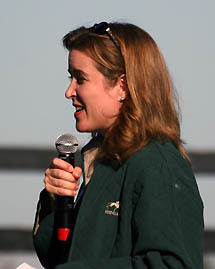 Education is the key for all - the race owners, the horses, and the future owners. 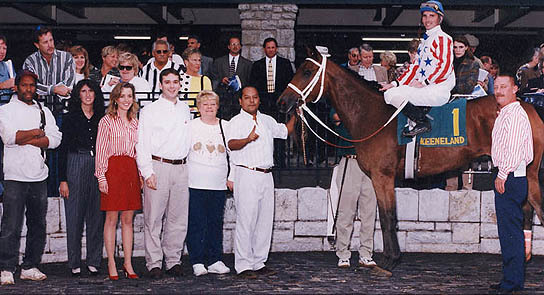 In 2006, we completed the organization of a non-profit company to formalize our program for finding retired racehorses new homes and new careers. See SecondStride.org for more information about our retraining and placement program for retired thoroughbred racehorses. 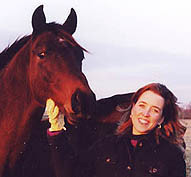 Below are a few pictures of Kim Smith, who has spent a lifetime around horses while living and working in Kentucky. 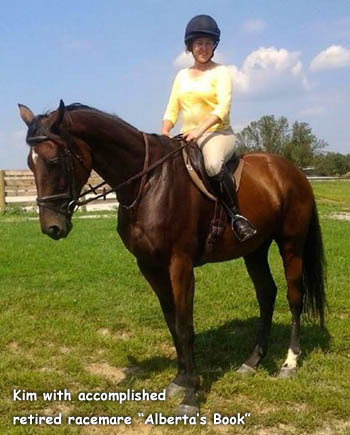 She is a Kentucky licensed thoroughbred trainer, full time manager of Moserwood Farms, and Founder of Second Stride, Inc.
Kim also actively pursues her hobbies of trail riding, dressage, and eventing. 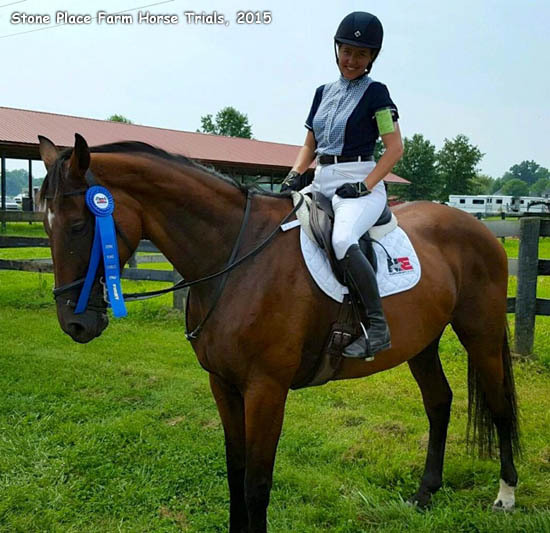 Her continuing education includes training with Susan Harris at Spring Run Farm, one of the premier eventing barns in the mid-south, which is conveniently located just a trail ride away from Moserwood. 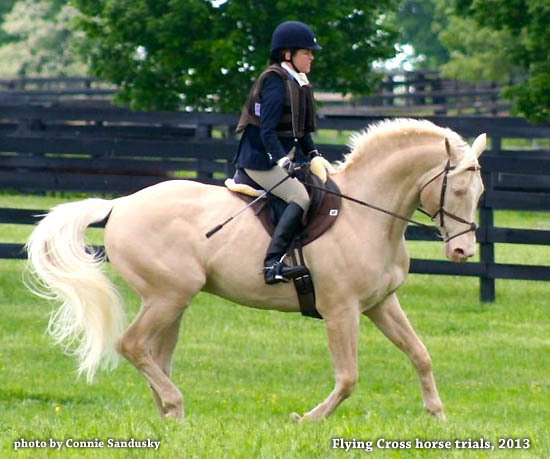 Click here for video of Kim Smith with dressage and jumping partner, Cremello German Warmblood stallion Mystic Blue Eyes GF ("Harley") at the Covered Bridge Pony Club Combined Test, Stone Place Stables, Prospect Kentucky.